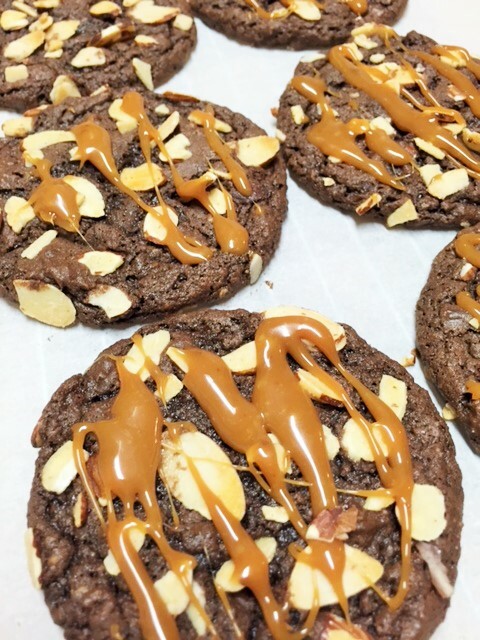 Nutty Chocolate Salted Caramel Cookies…………..
That title is a mouthful huh? Well, so is this cookie! Chocolate…yep. Chewy…yep. Crunch…yep. Sweet..yep. Salty…yep. This cookie has it all. It is happiness dancing in your mouth. It has that swoon factor and as my friend Patti would call it, its a moaner. I must warn you…it’s a messy cookie. A stick to your fingers, cookie. But trust me, you won’t mind at all. I was going to keep this cookie in my secret cookie stash, but I just cant. I just have to share it with the universe. It’s the right thing to do! The first time I made these, I made my own caramel sauce. But then when I decided to share the recipe, I tried them with store bought caramel candies. I figured a lot of people wouldn’t want to mess with making a caramel sauce. So, see there? Now you have no reason to NOT make these. The other thing is, I use sliced toasted almonds for the nut factor. But you can use pretty much any nut you want. Just promise me that you will make these…..soon….like maybe right after you read this. Like, stop reading and go..
Heat oven to 350. Line a baking sheet with parchment paper and set aside. Place caramel candies and 2 tsp water or milk in a heat proof bowl. Place in microwave just until caramels are soft enough to mix into a thick gooey sauce. Set aside. Bake for 12 minutes. Allow to cool on the baking sheet. Drizzle cookies with caramel. **Sprinkle some sea salt on the caramel drizzle and allow to set for at least 30 minutes. If you have any cookies left to store, be sure to store between layers of wax paper, because the caramel will be sticky. 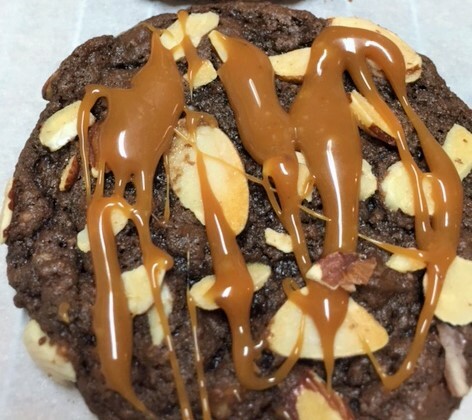 ** You can either mix the salt right into your melted caramels, or sprinkle the salt onto the caramel drizzled cookies. oh yes, these are an Oooh Baby kinda cookie, for sure!